AWS IoT Things Graph is a service that makes it easy to visually connect different devices and web services to build IoT applications. IoT applications are being built today using a variety of devices and web services to automate tasks for a wide range of use cases, such as smart homes, industrial automation, and energy management. Because there aren't any widely adopted standards, it's difficult today for developers to get devices from multiple manufacturers to connect to each other as well as with web services. This forces developers to write lots of code to wire together all of the devices and web services they need for their IoT application. 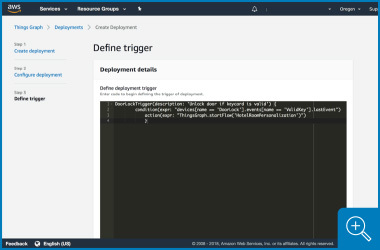 AWS IoT Things Graph provides a visual drag-and-drop interface for connecting and coordinating devices and web services, so you can build IoT applications quickly. For example, in a commercial agriculture application, you can define interactions between humidity, temperature, and sprinkler sensors with weather data services in the cloud to automate watering. 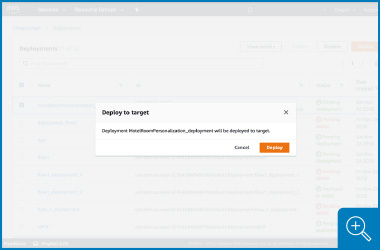 You represent devices and services using pre-built reusable components, called models, that hide low-level details, such as protocols and interfaces, and are easy to integrate to create sophisticated workflows. You can get started with AWS IoT Things Graph using these pre-built models for popular device types, such as switches and programmable logic controllers (PLCs), or create your own custom model using a GraphQL-based schema modeling language, and deploy your IoT application to AWS IoT Greengrass-enabled devices such as cameras, cable set-top boxes, or robotic arms in just a few clicks. IoT Greengrass is software that provides local compute and secure cloud connectivity so devices can respond quickly to local events even without internet connectivity, and runs on a huge range of devices from a Raspberry Pi to a server-level appliance. IoT Things Graph applications run on IoT Greengrass-enabled devices. AWS IoT Things Graph provides reusable models that represent devices and web services, and bridge differences in low-level details such as communication protocols and proprietary interfaces. It’s easy to combine models together to create IoT applications using a visual interface. You can use a library of pre-built models for popular devices types such as switches, locks, and Programmable Logic Controllers (PLCs), and reuse them in different application deployments. You can also create your own models using a GraphQL-based schema modeling language. 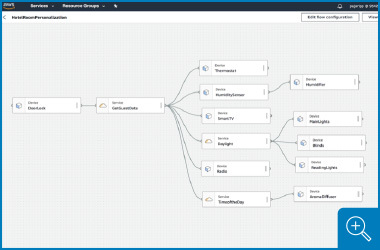 AWS IoT Things Graph provides a visual way to represent complex processes, such as welding car frames on a manufacturing line, automating shutdowns of production lines when anomalies are detected, and implementing building lockdowns when suspicious behavior is identified, as a visual workflow. A workflow consists of a set of interactions in a specific order between devices and web services. You simply drag-and-drop devices and web services, and define the order of interactions between them to create a workflow. For example, you can create a workflow that is triggered by a motion sensor that will automatically take a picture and send a text message. IoT Things Graph coordinates the interaction between devices and services, including any necessary protocol translation or unit conversion. 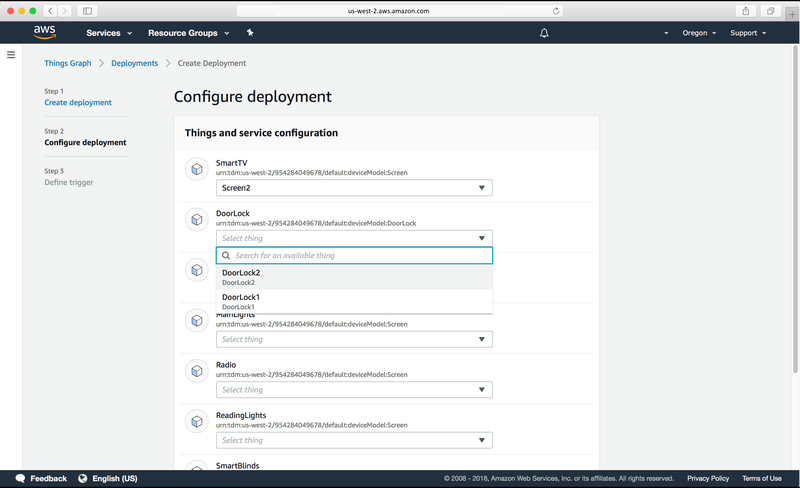 With just a few clicks, AWS IoT Things Graph packages and deploys your IoT application to AWS IoT Greengrass-enabled devices. IoT Things Graph coordinates interactions between devices and web services and retries any failed steps to keep your workflow running smoothly. 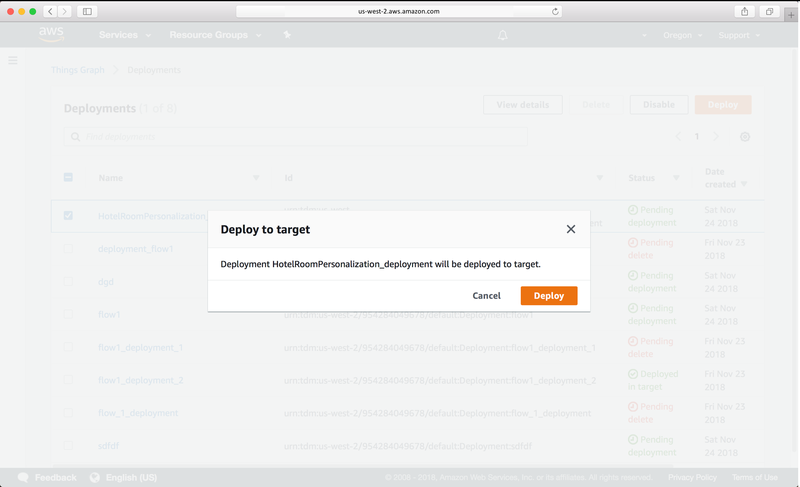 While your application is running, you can track metrics, set alarms, view logs files, and watch real-time status updates. Step 1: Build your flow by dragging and dropping device and web service models from the model library. Define interactions between the models by specifying which model outputs should be routed as inputs to other models. 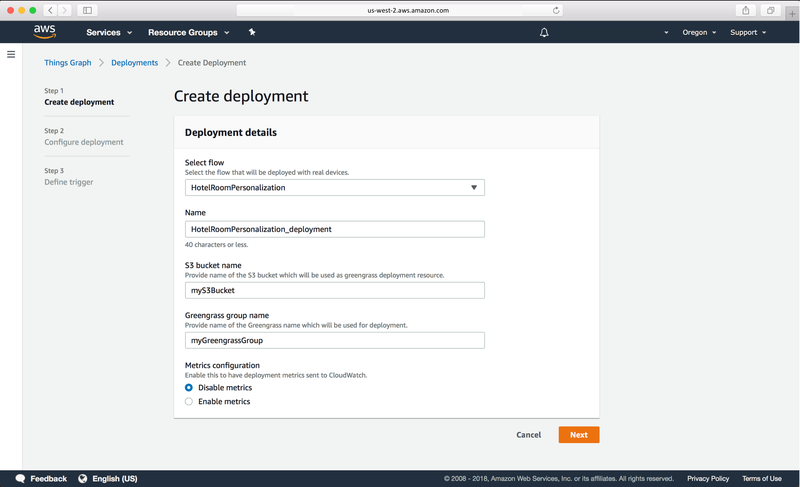 Step 2: Choose the Amazon S3 bucket to store the application configuration, and choose the AWS IoT Greengrass device where the application will run. 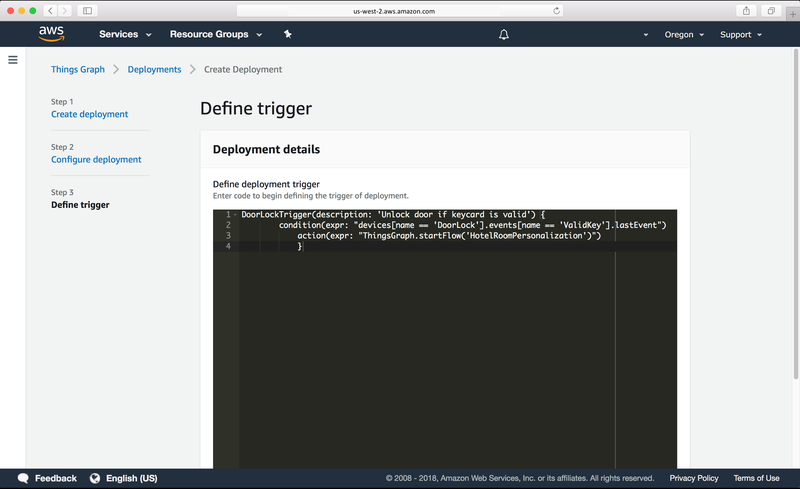 Step 3: Associate models to devices in your AWS IoT registry with a few clicks in the console. AWS IoT Things Graph uses the association to capture telemetry data from the devices in the application. Step 4: Define the trigger that will start the flow. Triggers can be outputs of locally connected devices. In this example, when the door lock detects a valid keycard, the hotel personalization flow is triggered. 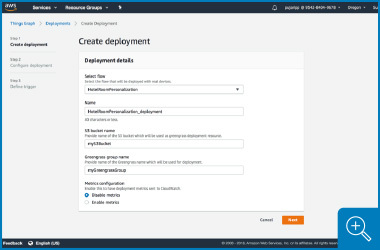 Step 5: Deploy application to AWS IoT Greengrass-enabled devices for local execution. AWS IoT Things Graph packages related dependencies and pushes to devices. IoT Things Graph orchestrates interactions locally. Smart home integrators want to connect everything, from refrigerators to light bulbs to TVs. However, they struggle to get devices working together because they come from different vendors. AWS IoT Things Graph eliminates the need to understand low-level device details so integrators can focus on building connected home applications. For example, IoT Things Graph makes it easy to build a home security solution that integrates motion sensors, smoke detectors, and cameras with facial recognition services so you can spot an intruder and generate alerts. Then, you can deploy the solution across different home layouts with just a few clicks. Industrial companies need to keep costs low and ensure the right inventory levels. They want to use connected devices to get new supply chain data, but it’s challenging to connect devices to the cloud and also to existing Enterprise Resource Planning (ERP) systems because it requires writing low-level code. AWS IoT Things Graph lets you build a model for each connected device and reuse it across hundreds of different facilities without having to rewrite deployment-specific code. As a result, you can gather device data and connect it to ERP systems in order to gain deeper insight across the supply chain. Because applications are deployed at the edge, they can even run without internet connectivity. Utility providers want to optimize energy consumption and provide better customer service, so they offer smart meters that control HVAC systems based on weather conditions. 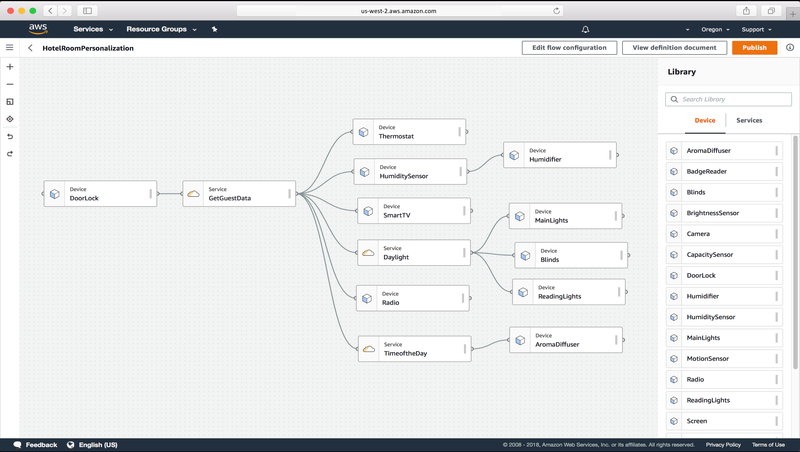 With AWS IoT Things Graph, you can add support for various HVAC systems, connect to weather data services, and deploy the application to smart meters enabled with AWS IoT Greengrass, without spending months writing new integration code.